My guest today is Dr. Trevor Cates. She teaches how our skin is a magic mirror and gives us clues to our overall health. Skin issues are a great way to determine if there are low vibration issues developing in your body. Dr. Cates is a nationally recognized naturopathic doctor. She’s knows as The Spa Doctor and she was the very first woman licensed as a naturopathic doctor in the state of California. She was appointed by none other than Governor Arnold Schwarzenegger. She’s worked for spas and seen patients in her private practice in Park City, Utah and her focus is on graceful aging. She just came out with her very first book, Clean Skin From Within. She has been featured many times on The Doctors, First for Women, mindbodygreen, and she’s the host of her own podcast. She also has her own skincare line and supplements formulated with natural and organic ingredients designed to help you achieve the clean and natural path to confidence and beautiful skin. Get your own customized skin profile at TheSkinQuiz.com. It’s free – Based upon your answers, it will give you great tips for glowing skin and vibrant health. Robyn: Hey, everyone. It’s Robyn Openshaw and welcome back to Your High Vibration Life. I always say this is my good friend, but this is really my good friend. This is, today, a really exciting episode. She is Dr. Trevor Cates. What we’re talking about today is your skin health because one of the things I have so much frustration about in the whole world of health is how doctors who talk about skin think that they are talking about this protective covering around the body. I’ll let Dr. Cates tell you more, but she is a nationally recognized naturopathic doctor. She’s knows as the Spa Doctor and she was the very first woman licensed as a naturopathic doctor in the state of California. She was appointed by none other than Governor Arnold Schwarzenegger. She’s worked for spas and seen patients in her private practice in Park City, Utah and her focus is really on graceful aging, which you believe if you see her in person. We’re going to link to her work in the show notes because she just came out with her very first book, Clean Skin From Within. She has been featured many times on The Doctors, First for Women, mindbodygreen, and she’s the host of her own podcast, The Spa Doctor. I really want to dive in with Dr. Cates about how the key to healthy skin is health on the inside and also outer nourishment. I really want to make sure we ask her if we should be able to eat our skincare products, so right about the time that you’re hearing this, her new book, Clean Skin from Within, is releasing March 2017. Dr. Cates, the Spa Doctor skincare and supplement lines are formulated with natural and organic ingredients designed to help you achieve the clean and natural path to confidence and beautiful skin. Welcome, Dr. Trevor Cates. Trevor: Thank you, Robyn. It’s so great to be here with you. Robyn: I want to talk a little bit about the whole idea of dermatology. I used to go to a dermatologist. I had a super crazy thing show up on my skin right about the time my divorce. They told me it was related to stress and they wanted me to take an oral antibiotic. Another time, for several years, I had eczema. Before I turned my diet around, before I got off of dairy products, before I stopped eating processed foods, they wanted me to put steroids on my skin. In fact, I did it. Tell me what your difference is, the way you look at the skin. I know that you call it the magic mirror. Tell us more about that. Trevor: Yeah, absolutely. I do have a different approach looking at skin. Our skin is our largest organ. It’s right on the surface of our body, so we can use it as a great tool. I actually call it, like you said, our magic mirror, because it gives us great clues about our overall health. The overall approach, the conventional approach, is to suppress and cover up with, like you mentioned, the topical steroids, also antibiotics, or even in cosmetics, covering up with makeup. We’re not addressing the root cause, the underlying cause of what’s going on if we just suppress it. We’re missing an opportunity to learn something about our health, about root causes behind what might be going on, as well as our lifestyle choices, that maybe our skin is trying to tell us something. Instead of ignoring and covering it up, let’s pay attention to it. Robyn: We talk on this show all about raising the frequencies that we live in and we’re about to really get into electromagnetic frequencies and some of the things that disrupt the frequencies that we want to live at. We want to live more in states of gratitude and states of joy and states of peace, even though frustrating, annoying, low vibration, even angry things might happen to us every day. We all have been talking on this show, my interviews have been talking about external things that we do and things that we eat. When we think about the skin, I hope that you’ll talk a little bit about what you think those high vibration materials are that when we eat them, they show up as beautiful skin, so what kind of internal things can we do that show up in younger looking skin because Dr. Cates actually looks about 30 and she’s in her mid-40s. She actually walks the talk. Tell me what you think the high vibration materials are that we should be eating, that we should be building our skin out of because it’s turning over all the time. Also, tell us a little bit about what kind of high vibration materials we should put on our skin to take good care of it. Trevor: Absolutely. I think it’s so important to talk about that because there are many different layers of what we do for our skin. There are the foods that we eat and also, our stress, our stress levels, and our emotional state play a role in the health of our skin. If we are overly stressed, that impacts our cortisol levels, our adrenal hormones, which can flare up skin issues, create more inflammation that shows up on our skin. Also, the skincare products that we use. If we’re using low quality, chemical-laden kinds of ingredients, that is going to contribute to skin issues. There are a lot of different factors here. We start with we’re talking about diet, though. Certainly, the foods that we eat do impact our skin’s health. Now, your dermatologist may not agree with this. They may tell you that what you eat doesn’t affect your skin’s health. Unfortunately, that’s what a lot of conventional dermatologists will tell you, but even the research is now showing that when we eat certain foods like sugar that that can lead to more problems like acne or accelerated aging. Instead of eating processed and sugary foods that have a low vibration frequency, we want to include foods that a lot of plants like avocados are excellent for our skin. They contain those monounsaturated fats and polyphenols, those antioxidants that help protect our skin from the inside out. Also, things like wild Alaskan salmon. If you eat fish, the omega-3s in there are fantastic for helping reduce inflammation and also contain astaxanthin, a potent antioxidant that helps protect our skin. Then also, leafy greens are fantastic, things like kale and chard and those kinds of vegetables are some of the great foods that help nourish our skin from within. Robyn: We love you for plugging the leafy greens around here because at Green Smoothie Girl, we really believe that it’s the most foundational thing that’s missing in the American diet is those really nutrient-dense, micronutrient-dense foods that the green ones are the highest. Course, we branch out and that’s not the only sets of foods that we like. You’ve mentioned some really, really good ones. You mentioned some high fat foods and you’re just barely old enough and I’m definitely old enough to have lived through the decade of the low fat food cult. You and I have seen a bunch of food cults and not all of them were helpful. In fact, there’s damaging effects of every single diet that I’ve seen come out. I see millions and millions of women chase that. This is a new fad. Now finally, we’ve figured out the right way to eat. What do you have to say about that because you mentioned some really high fat foods or things that in the 1980s we were told were bad for us. Tell us about the skin and fats. Trevor: Yeah, absolutely. I do remember those days well, the low fat diet craze, and it certainly wasn’t my healthiest moment when I was eating low fat. Yeah, absolutely, so things like avocados and coconuts are another example. Coconut oil is another great oil for the skin internally, as well as externally. The thing with the skin is that there is this lipid bilayer that we have on ourselves, our skin. We need fats. We need good oils to help nourish our skin from the inside out. When we deprive ourselves of the good fats and maybe you’re eating a low fat diet, we’re not getting those fats that we need for our skin cells to look plump and healthy-looking, that healthy glow that we can have. Then, if we’re eating the wrong kinds of fats, if we’re eating trans fats, hydrogenated oils or partially hydrogenated oils that are in so many of the packaged, processed foods out there that are just … People so quickly grab those and without looking at the ingredients. The problem with those fats are they’re going to create more oxidative damage in our body, more free radical damage, that’s going to age us faster. Also, it’s not going to provide us the right kinds of oils. Our cells are going to be more rigid and less elastic than if we eat those good oils. Robyn: There’s good fats and there’s bad fats and so in the 1980s, they were on to something, which is stop eating those processed fats, those fats cooked at high temperatures over 400 degrees. It literally changes that into this weird plastic food. You’ve given us some really good example of what good fats are and I’m glad that you said that we need them. They protect that lipid membrane, which is made up of fatty acids around every cell. Am I right? Trevor: Right. Absolutely. Yes, we do need them. Robyn: Why do you think dermatologists are … You kind of mentioned it lightly. We might have some dermatologists listening and I just think it probably is related to their training, but why do they scoff at going deeper than the skin when treating the skin? Trevor: No, I don’t want to say anything bad about dermatologists because I’ve got some great friends that are dermatologists. I refer to dermatologists because I think they’re great at diagnosing skin issues. They help protect when people have skin cancer and those sorts of things. They’re great at identifying those sorts of issues that can be very important health issues. The problem is that they don’t receive, medical doctors in general don’t receive, within their medical training, any information, if any. Sometimes, they get a little bit on nutrition and so because of that, when they’re not educated on something, they can’t really give a lot of information about it. There is some research on nutrition and how it can help the skin or hurt the skin when you’re eating the wrong foods, but unfortunately, a lot of dermatologists are still not recommending it. Now, I should say that a lot of the dermatologists I know that are practicing more integrative dermatology are becoming more aware of the role that diet and lifestyle plays in what we eat. I just wish that all dermatologists would start to think this way because we could prevent so many skin problems from developing into other health issues if we addressed some of the root causes, some of the nutritional issues, and we stopped just suppressing and covering it up so quickly with medications. Medications play their role in health care certainly and I’m certainly glad to have that as a tool in my tool belt, but I find that so much of what we do with skin can be addressed through healthy lifestyle. Robyn: Yeah, I really see that shifting tide of even very traditional dermatologists who didn’t get that training in medical school because it’s not offered. There’s no going below the surface and looking into what’s going on in the liver, what’s going on in the microbiome that is showing up on the skin that you understand because you went to a holistic education path. Honestly, I think that there are some of them going out and getting more training, even though they can’t bill any insurance codes when they teach you how to look at the microbiota and take a look at what’s going on with leaky gut that’s showing up in your skin or why your immune system is down and that’s why you keep having all these skin issues is market demand. I honestly think that they are going out and they are getting extra training and they’re not just looking to their continuing education provided by medical school because there’s a market demand. I haven’t seen the statistics in quite a few years. I know that like 2008, 2009, 2/3 of Americans were seeking care outside of standard of care, so 2/3 of Americans were seeking holistic or we’ve started to call it more integrative or we’ve started to call it more functional medicine, which is looking to the root cause and treating the whole organism as an integrated whole instead of let’s slap some steroids on the skin and call it good. Trevor: Yeah, I know. It’s so important to address the root causes. With skin issues, I’ve identified that there are six main root causes that contribute to skin problems. I talk about them in my book, Clean Skin From Within, because I think it’s so important to look to these root causes, things like you mentioned microbiome. The gut microbiome is so important to the health of the skin. It is one of the primary ways that we see skin changes is when we address the gut microbiome because the skin has its own microbiome, its own balance of microorganisms that live on and protect the skin and keep it from breaking out, from aging rapidly. When we do things internally to support the gut, then that can help our skin microbiome. Then what we put on our skin also can help with the skin microbiome or hurt it if we’re putting things on there with toxic ingredients. It’s getting to those root causes like microbiome or hormone imbalances or nutritional deficiencies, internal inflammation. These are some of the big root causes that lead to skin issues. When we shift our attention and our focus and our treatment to addressing these and supporting the body overall, it’s amazing what happens. Our skin clears up. We have clear, glowing skin, and we have better health overall. We have more energy. We’re sleeping better. Mentally more stable, better memory, all of those kinds of things that we get when we address the root cause. That’s why I love talking about skin in this way and that’s why I am different from a dermatologist because I’m not going to just talk to you about your eczema. I’m going to talk to you about your overall health too because we’re looking at eczema. The fact you have eczema is a sign that something is out of balance, so when you restore your health, eczema will go away and these other issues, skin or other health issue you might have will go away and the future of your health for years to come will be improved. Robyn: Just as an aside here because I’m sitting here just feeling a little grieving going on about what happened, but I also felt very empowered by what happened, but when my second child, my Emma, who’s 21 now, was a baby, I was being treated for this eczema. I didn’t realize this was a gut issue. I didn’t realize what was going on internally and so not only was I given steroid cream, which is devastating to the immune system, stays in the blood for at least six months, so immune-suppressing, which is sad considering that it was an immune failure in the first place, didn’t know that it was related to eating dairy. I was given this lotion. I was given lotion. I thought I was putting lotion on my skin and it sort of helped me from scratching my skin off all night. I’d wake up covered with scabs because of my issues with eczema. The super sad thing is not only did they not tell me that I was smearing steroids all over my skin, I started putting it on my baby daughter. She started showing up with eczema before we changed our diet and I was putting it on her. I went to the pediatrician and luckily happened to mention it to him and he got very upset and he said, “Do you want to shut her adrenal glands down?” Then I started crying because I had no idea that’s what I was doing. Here’s the thing. I took my health into my own hands. I started studying for myself. I learned the connection. I got off of dairy. I asked him if it would make a difference as I started to learn. Will it make a difference if I got off of dairy? He scoffed at me. He was upset with me and told me no. I got off of it and never had eczema again. That was when I was 28. Now I’m almost 50 and so just as an example of how important it is what Trevor is teaching here. I also want to pull out a couple of great quotes and come back to them. 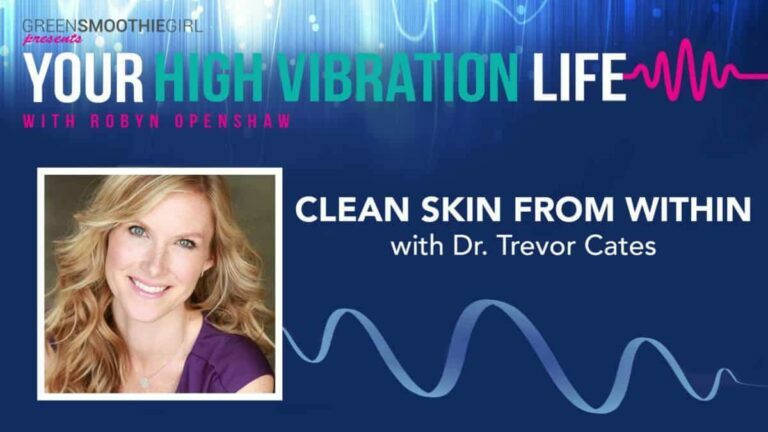 We’re going to link in the show notes to Trevor’s new book, Clean Skin From Within. I love how the title tells me right then and there your skin is so much more than your covering. We’re also going to link her skin quiz and I want to get to that before we finish. We’ll ask you about why everyone listening to this should take your skin quiz. I want to pull back to a couple of really great quotes. First of all, one of them is you’re talking about six root causes to skin issues. I’m really hoping that our audience will take a look at these six root causes of skin issues that you cover in your book before going to something really harsh like an antibiotic or a steroid, which may or may not deal with the symptom, but doesn’t deal with the underlying issue, so those six root causes are something we really should look at first because they’re systemic and they’re foundational. I want to back up to your quote, “Your skin has its own microbiome.” Tell us about that, your skin has its own microbiome, and then tell us about what we need to look for in what we put on our skin. Trevor: Yeah. Our skin has this great balance of microorganisms that live on it and protect it and so a lot of times, people don’t realize, they don’t think about our skin as being a separate organ that has its own microbiome and that functions this way. What we put on our skin sits on our skin, but also can penetrate our skin and get into our bloodstream. When we use personal care products that have antimicrobial, antibacterial ingredients or that have a really high pH, for example, they can actually disrupt the skin microbiome. We want to be careful about what we put on the skin and, in fact, the pH of the products should be in a mildly acidic range, which a lot of people don’t even realize that the skin actually does best with a 4.5, 5 pH range, rather than a more alkalinizing range, which is oftentimes what we talk about when we’re eating foods, but with the topical products, we want them in that mildly acidic range. That is going to help the skin microbiome flourish. When our skin microbiome is flourishing, we’re going to have less of the skin issues like eczema, psoriasis, acne, as well as premature aging. When our skin pH gets too high, then we’re going to be more likely to have these skin issues. That’s one of the reasons why I created the skincare line is because I wanted natural products that also incorporated this mild acidity and ingredients that help promote the skin microbiome, rather than disrupt it. Robyn: Interesting. I didn’t know that cosmetics sometimes have antimicrobial, antibacterial chemicals in them, but I’m not really surprised because that seems to be the big fad is this idea that if we just kill all the microbes that somehow, we’ll be healthy, which doesn’t actually make any sense. That’s a whole other show, but this makes me really, really happy that I’m using the Spa Doctor products and so my skin feels great on it. It doesn’t have any heavy smells. You and I have talked a couple times about should we be able to eat our skincare products. Will you talk about that? Trevor: Yeah. Honestly, if you can’t eat your skincare products, you probably shouldn’t be putting on your skin because we do absorb some of the ingredients that we put on our skin. There is actually a lot of research showing that things like parabens, for example, is a chemical ingredient in many products. Even some so-called natural products contain things like methylparaben or propylparaben. You’ll see paraben at the end of the word. What we found with parabens is they’ve actually been detected in numerous tissues in the body, including breast tumor tissue, so we know that parabens get absorbed through the skin and get taken up into the body and even into breast tumor tissue. This is a scary thought. We need to stop this idea that what we put on our skin isn’t going to get absorbed. If you can’t put it in your mouth, then you probably shouldn’t be putting it on your skin. Now, do the products taste great? Do you want to eat them? Now, that’s a whole different conversation. Robyn: Right, but if you can tell me, if I can look you in the eyes and say, “If I eat this stuff, will it hurt me?” and you can say, “No, it won’t,” that’s what I need to hear because parabens, that’s just a great example, but there’s how many chemicals are in our skincare products that we think it’s just on my skin, but it’s really going into our bloodstream. How many would you say? Trevor: Let me answer your question because yes, you can eat my skincare products. I can’t promise you they’re going to taste good. However, I would say step four, the Glow Boost, which is an oil blend, you could probably put that in your salad dressing and that would taste pretty good and you wouldn’t have any problem with that. The other ones probably won’t taste very good, but you could eat them. I wouldn’t live off of them and I wouldn’t promise they’re going to taste good, but on average, to answer your other question, on average, we use nine personal care products each day, which exposes us to 126 unique ingredients, if you’re using nine products. Now, many women are using more than nine, if you think about the shampoos, conditioners, deodorant, hairspray, and then for men, like shaving lotions and gels and all of those kinds of products and cosmetics. It’s a lot. It starts to add up. In the United States, there have only been 11 ingredients banned by the United States FDA, which is crazy when you compare it to something like in Europe where they’ve banned over a thousand ingredients in personal care products. The personal care products we have on the shelves in the United States unfortunately contain a lot of harmful ingredients. Robyn: I did not know that. A thousand chemicals that Europe has banned from personal care products and only 11 in the United States, which makes sense when you consider the fact that for some reason, our FDA keeps allowing the food industry to put monosodium glutamate into our foods, even though there’s more complaints about it or NutraSweet than all other food additives combined. Decades now they keep letting that happen and probably because the influence of billion dollar industries. I’m really grateful to have pure voices in the field of skincare now. If we’re going to get exposed to Dr. Cates says 126 ingredients in the average woman’s regimen of using nine products a day, don’t trust the FDA to screen all the baddies out of our products. Am I right? Trevor: Absolutely. They don’t. There are some shortfalls with the food industry and supplement industry, but also, with personal care products, it’s even less regulated. It definitely is something that needs to be updated. It’s being left at the time up to manufacturers to make clean products or products that are safe for people. Unfortunately, most manufacturers don’t have health in mind. They have just what’s going to sell and what can they market the easiest and what’s going to be cheapest to make. With parabens, they’re showing up in the tissues and also things like phthalates, for example, that are in synthetic fragrance. So many of our personal care products contain synthetic fragrance and they contain phthalates, which are known hormone-disrupting chemicals. Those show up in the body, as well, and in urine samples, so we know that we are getting exposed to many of these harmful ingredients. They don’t just sit on the skin. There isn’t a specific number we could say 80% of all products are absorbed. We can’t. It can’t be a blanket statement because it depends on the ingredients and the products and the skin, but many of these things are getting absorbed because we do have a lot of research that shows that. Robyn: That makes sense and it’s really good to know. We’re going to link to Dr. Trevor Cates’ new book, as well as her skin quiz. You have four different skin types that you’re teaching us about in the skin quiz, right? Trevor: It’s actually five different skin types. I love the skin types because I got tired of hearing the typical skin type names, dry, mature, sensitive, those kinds of things, because I look at my patients as people, so I wanted to give each of these skin types a person’s name. They’re based upon patients of mine and what I did is I classified them based upon their root causes. Like I said, there are six root causes and each of the five different skin types has a combination of root causes that tie into them. That way, when you identify your skin type, you know which root causes are going to be your primary issues that you need to address. My skin types are Amber, Sage, Olivia, Heath, and Emmett, so they’re people names instead of the typical names. When people take the skin quiz, they’ll find out which of those five skin types they are. Then I give you some recommendations based upon those to help you address the root causes. Then in chapter six of my book, I talk to you about how you can customize your two week program based upon your skin type. Robyn: Fantastic. I’ve been loving using your skincare products and I want you to tell us what you’re giving your High Vibration Life listeners, but in the show notes, which are at greensmoothiegirl.com/episode23, tell us what other cool stuff that your High Vibration Life listeners might find. Trevor: What I want to offer your audience is to get my book for free and all I’m asking is just to pay for the shipping and handling. People can get my book Clean Skin From Within for free and also, when you get the book for free and just pay the shipping and handling fee, then you also will get my best and worst foods for skin cheat sheet, so that tells you exactly the best, the very best foods for skin and the worst foods to avoid and why. Then you also get my 10-video series of natural skincare tips. You have a video series. I talk about do-it-yourself skincare tips and your daily skincare routine, how to reduce toxins in your skincare. All of that are bonuses when your people get my book, so I really want them to have this book. There’s such valuable information in there. Robyn: I’m really excited for your book to launch, my friend. I’ve been excited about it for a long time and I’m excited for more women to learn about the fact that their skin isn’t where their aging is. Their skin is where their aging shows. Of course, we all want to look more like you. Tell us one more thing before you go. Why does our skin show so much of our emotional state? Trevor: There is such a great connection between our emotions and our skin. It’s a vicious cycle that we can get into because skin issues can both cause stress and emotional upset can trigger skin issues. There’s this connection and part of that has to do with our adrenal function and the adrenal hormone cortisol. When we get stressed, it increases cortisol and cortisol creates more inflammation internally that shows up on our skin. I call that skinflammation because it’s internal inflammation that shows up on our skin. If you have a current skin issue, it can make it worse by being stressed or being emotionally upset. Sometimes, it can actually trigger that to happen and so then we get into this vicious cycle because then we’re more stressed because we have a skin issue. When we manage our stress, when we get into a more emotionally balanced state, then that’s really going to help with our skin. It’s one of the reasons why I talk about how to have a clean mind. On my book, I have four aspects. I have clean plate, clean slate, clean body, and clean mind because there is such a connection to our skin’s health. Robyn: What a great way to remember it and to encapsulate it, so check out the show notes at greensmoothiegirl.com/episode23. I’m so excited about everything that you have coming up, Dr. Trevor Cates. For Your High Vibration Life, remember from Green Smoothie Girl and Dr. Trevor Cates, the Spa Doctor, remember that eating high vibration materials shows up on your skin for good or for bad and put a cherry on top by putting high vibration materials on your skin, too. See you next time. How do you get the book for free? I clicked on the links and it doesn’t show getting it for free. Trevor said on the show that she was offering your audience the book for free if we paid shipping and handling. Hi Christy, that was a special deal prior to her book launch. After that, of course she wants to earn some money for the book she wrote! Sorry! Hi Robyn! Just found out about you today when you popped up on my Facebook page…loving your podcasts!!!. I listened to this show, and am wondering if the link to the skin test is not available? I don’t see it anywhere. Perhaps it’s because her book is available?